One of my goals with this blog is to give readers an unedited glimpse into my life. My photographs are not professional, they are taken on my cell phone. I don’t have any fancy photo editing programs on my computer. What you see is what you get – much like the Town of Jupiter. I’m not expecting to win the Pulitzer Prize with this blog. Before church yesterday, my boyfriend (we will call him P) and I went to Loggerhead Park for some sand and sun. I introduced Georgia boy P to the art of “shelling.” Like most non-native Floridians, P thinks that every shell is beautiful and worth taking home. This is a lovely sentiment, as I agree that shells are one of Mother Nature’s greatest creations. However, you can only have so many jars and vases full of Orange Jingles and Scallops until you become a selective sheller. 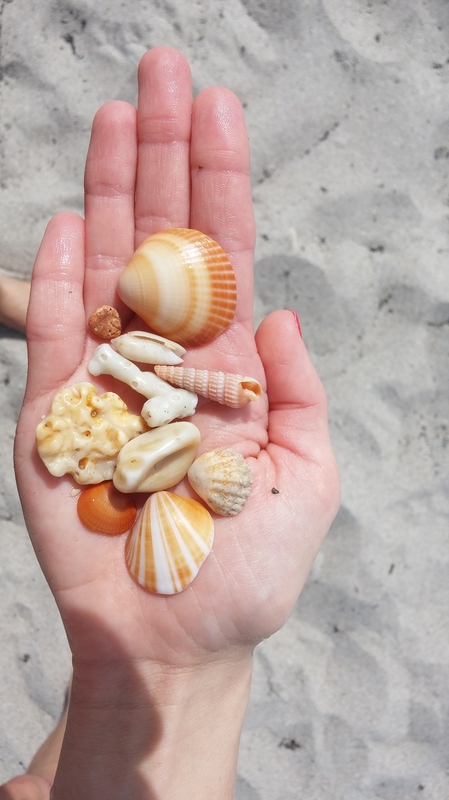 I showed P my preferred method of collecting shells: stand on the edge of the beach and just as the seawater is receding, plunge your hands into the sand and pull up a bounty of shells. Be careful not to get knocked over by a wave! Sort through the shells in your hands, pushing aside the broken pieces. Keep your eyes peeled for a polished, unbroken shell. Just as the next wave is ready to go out, dump the discarded shells back into the water and repeat. Shells found at Loggerhead Park, Juno Beach, FL. Notable shells include an Olive shell, a Boring Turret Snail shell, a Kitten’s Paw, and a piece of coral. Nice!! That was like a tiny vacation. Great photos. We’ve been to Juno many times while visiting our niece when she attended Florida Atlantic University in Jupiter. We never had a chance to get to the beach, but we did visit the Jupiter lighthouse. It’s a great area for relaxation and fun. Thanks so much for visiting my blog, Ron! I promise there will be new posts soon.